Acknowledged author Jonayhan Orsay wrote 10th Edition Examkrackers MCAT Complete Study Package comprising pages back in 2016. Textbook and etextbook are published under ISBN 1893858839 and 9781893858831. 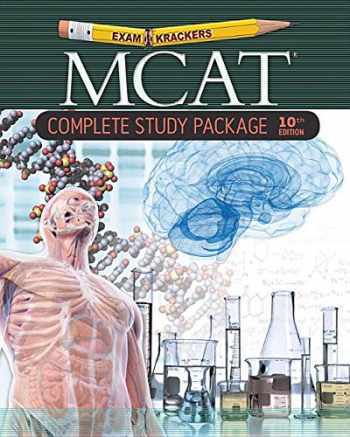 Since then 10th Edition Examkrackers MCAT Complete Study Package textbook received total rating of 4.5 stars and was available to sell back to BooksRun online for the top buyback price of $98.15 or rent at the marketplace. "Examkrackers MCAT Study Package" Brought to you by MCAT Specialists for over twenty years - Examkrackers MCAT Study Package was designed to teach you how to think MCAT. We've written our materials with a dual voice: one voice that teaches all the content there is to know on the MCAT and a second voice that tells you how to approach this content when facing MCAT research style passages and questions. The MCAT will ask you to apply biological, physical and social sciences simultaneously, so our team of doctors and admissions counselors have built in MCAT learning tools in the columns of every page that build your mental map for you, making crossing disciplines second nature. Our books will teach you how to read (when to read throughly or leisurely brush through), the best times to read and how many times to read your MCAT material. This study format, combined with full mini-exam at the end of every chapter will ensure that the concepts on the MCAT come naturally to you on MCAT day. What you will find in this six volume set: [€[Full review of all content tested on the MCAT [€[Proven test-taking strategies developed at Examkrackers [€[Instructive full color visuals on every page [€[Links between MCAT concepts across disciplines [€[24 questions within each lecture to reinforce the material [€[Simulated MCAT practice with thirty-two 30-minute topical exams in real MCAT format The Complete Study Package Set includes all six Examkrackers MCAT preparatory manuals: [€[Reasoning Skills: Verbal, Research and Math [€[Biology 1 Molecules: Biochemistry [€[Biology 2 Systems [€[Psychology & Sociology [€[Chemistry: General and Organic Chemistry [€[Physics"